This book reveals a 12,000-year-old Egyptian system of prediction so exact it can foretell every day of the year, a method based not on the planets, astrology, or intuition but on Earth's magnetic rhythms. Reviewing the cycles of history from biblical times to the present and prophecies of the future from Nostradamus to Edgar Cayce, Martinez reveals that our current 'time of troubles' is not the beginning of Rapture, the Apocalypse, or Armageddon, but of the embryonic stage of a Utopian Age--the 'Quickening' of the human race. As well as offering a preview of the Paradigm Shift and Golden Age ahead, readers can use the Tables of Destiny to make their own predictions of the future. Reviewing the cycles of history from biblical times to the present and prophecies of the future from Nostradamus to Edgar Cayce and Jeane Dixon, Susan B. Martinez reveals that our current "time of troubles" is not the beginning of Rapture, the Apocalypse, or Armageddon, but of the embryonic stage of a Utopian Age--the "Quickening" of the human race. Reviving the lost science of prophecy, Martinez explains why so many "great prophecies" have failed and presents the 12,000-year-old Egyptian system of prediction so exact it can foretell every day of the year, a method based not on the planets, astrology, or intuition but on Earth's magnetic rhythms. Using Earth science, historical research, religious texts, spiritualism, and patterns within the cycles of war and political milestones, she demonstrates that the past is the hidden key to the future and uncovers the prophetic numbers of Earth's cycles--11, 33, 99, and 363--as set forth in the Egyptian Tables of Destiny, ancient texts brought to light by the 19th-century Oahspe Bible. Explaining how readers can use the Tables of Destiny to make their own predictions of the future, she presents her own forecasts of the risks and costs of technological progress, the destiny of America, the up-and-coming global religion, the truth behind climate change and the cause of earthquakes, and the true life expectancy of planet Earth as well as offering a preview of the Paradigm Shift and Golden Age ahead, a time of global unity and awakening of the soul of the world. * Susan B. Martinez, Ph.D., is a writer, linguist, teacher, paranormal researcher, and recognized authority on the Oahspe Bible with a doctorate in anthropology from Columbia University. The author of The Psychic Life of Abraham Lincoln and The Hidden Prophet, she is the book review editor for the Academy of Spirituality and Paranormal Studies. She lives in Clayton, Georgia. 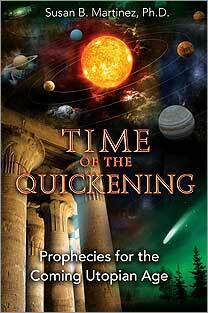 To order Time of the Quickening from Amazon.com, click here! Bear and Company, the publisher of Time of the Quickening, has a web site feature that allows you to preview this book. Susan B. Martinez, Ph.D. had an interview about her book which you can listen to here.